Custom Coaches will likely be put up for sale following the company’s fall into voluntary administration last week. Deloitte Restructuring Services Partners Vaughan Strawbridge and Tim Norman were appointed Voluntary Administrators of Custom Coaches Pty Ltd and Custom Coaches (Sales) Pty Ltd On May 30. The company has about 300 employees and operates from two manufacturing sites – Villawood, Sydney and Royal Park, Adelaide. Custom Coaches also has a service centre in Brisbane. 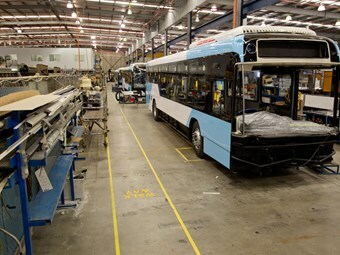 United Kingdom bus builder Alexander Dennis Limited (ADL) bought the entire issued share capital of Custom Coaches in 2012, according to previous reports. Strawbridge says it is early days as far as their appointment is concerned. "We are continuing to trade the business while we undertake a rapid assessment of the companies’ financial position. "Early indications are that the level of orders has deteriorated in recent years while the cost base of the business has remained relatively fixed. "Custom Coaches parent company has funded the companies’ losses over the last few years and regretfully is no longer willing to do so, which has resulted in our appointment. "We intend to seek a sale of the business as a going concern to secure the ongoing employment of the workface, maintain supply to customers and continue to trade with suppliers," says Strawbridge. NSW Minister for Transport Gladys Berejiklian says she is very disappointed to hear about Custom Coaches. "This Government is creating thousands of jobs and will continue to do so by investing in major infrastructure projects like the $8.3 billion North West Rail Link and $2.1 billion South West Rail Link," she says. "We are serious about creating jobs, particularly in Western Sydney, that’s why we’ve grown services providing an extra 8,000 public transport services and continue to invest a record $60 billion in infrastructure." Custom Coaches invested $20 million into the Villawood site in 2009 which reflected the company’s long term commitment to maintaining manufacturing in Australia, according to the company’s website. Custom Coaches’ immediate future will be discussed at a meeting of creditors scheduled for June 12.